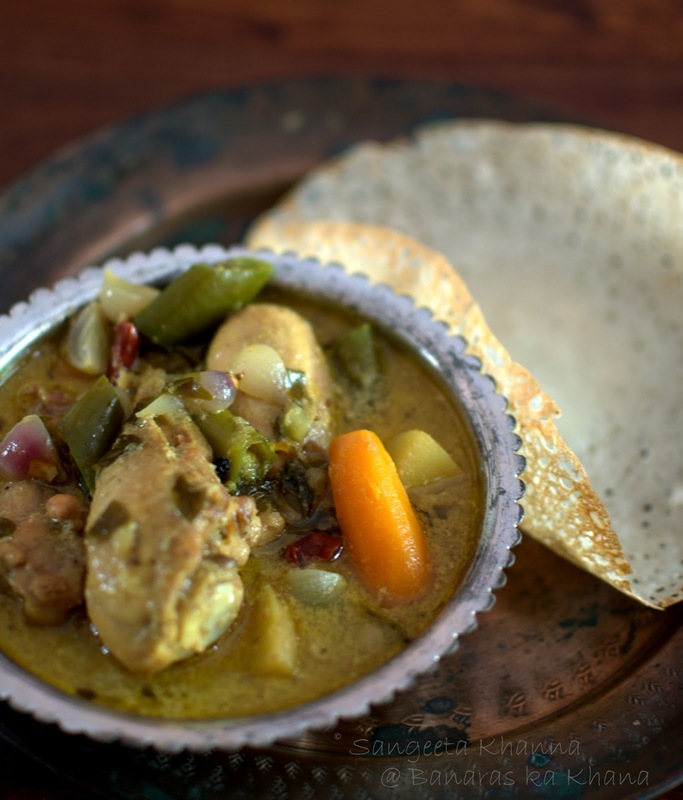 Kerala style chicken stew and appam is one of those comfort meals we look forward to. I am a fan of coconut milk gravies actually. I keep making a lot of chingri malai curry, vegetable stew, meen molly and Thai green curries with coconut milk. 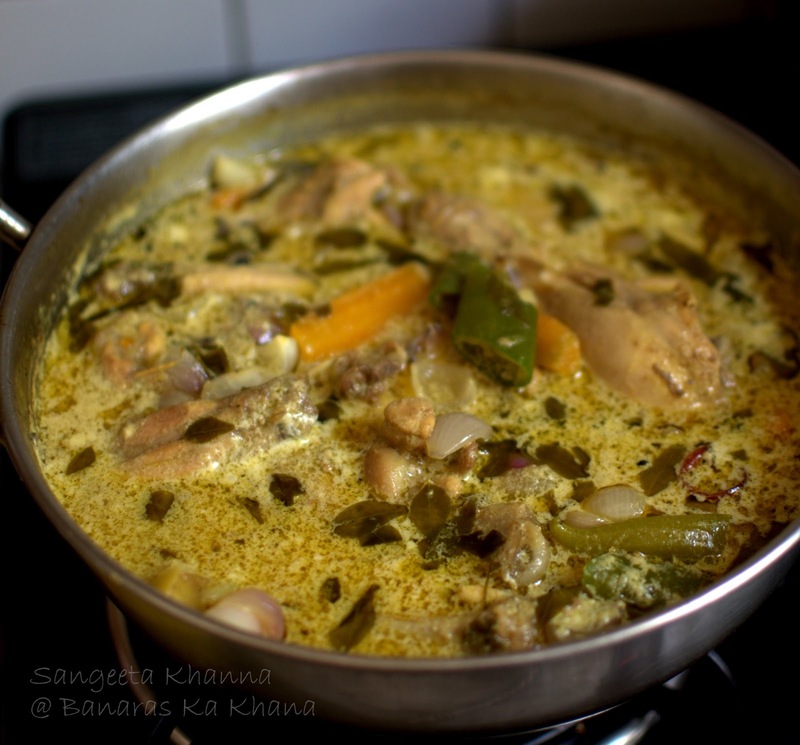 Kerala chicken stew or vegetable stew is a favorite too, more because these curries are so healthy and so tasty too. 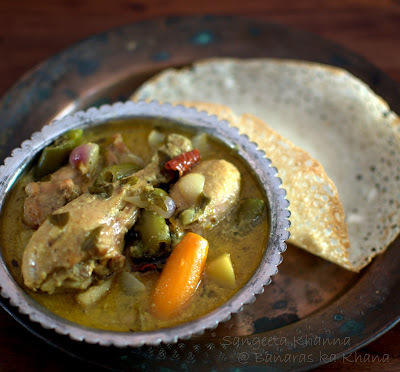 What creamy and rich curry would be as healthy as this stew and what crisp bread or pancake would be the beat combination of healthy fermented goodness. A creamy flavorful curry to dunk a crisp pancake, coconut goodness at it's best. To make it even better, the meal comes around in less than an hour even if you start from scratch. Well, if using rice powder and instant yeast and coconut milk powder or coconut milk from cartons. That is what I do as I find them good for my taste. Let the purists work hard for the daily grub. whole red chilies 6-7 nos. I set the yeast for proofing before I started my stew preparation for this dissolve the yeast n sugar in 1/2 cup of warm water, it gets frothy in 10-15 minutes....to be mixed into the other things. Make a paste of coconut and the cooked rice in mixie and mix with rice flour and yeast mixture and some water to make a batter of dosa like consistency....keep in a warm place until it gets frothy. In my case it was ready as soon as the stew finished. Indian summers. Mix salt to taste and heat the greased appam pan (mine is non stick) and pour a ladle full of batter in the middle, now immediately swirl the pan, holding the handles, so that the batter coats the sides of the pan, there should be just one swirl and there should be some batter remaining in the middle of the pan. Cover the lid immediately, it takes about 2 minutes to cook, check by touching in the center, it is cooked if it is firm and spongy. Repeat the process to make more appams. 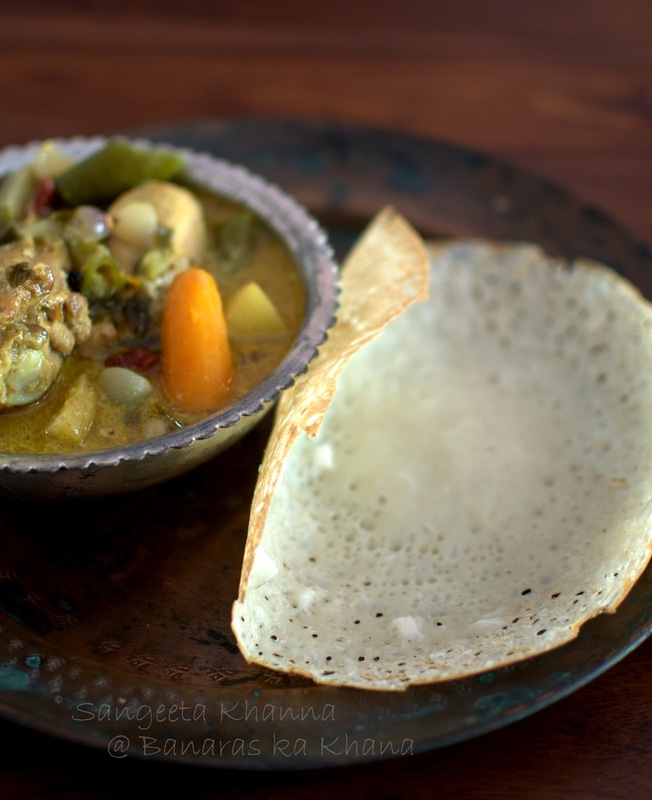 You don't need to use oil after the first appam so the process is easier than it looks. The first appam is not always the right shape, don;t worry if it happens and feed the first appam to your pet or birds in the garden. If the appam is too soft to hold the shape after removing form the pan, just add a little semolina and try again. The appam should come out crisp on the edges and spongy in the middle. I normally keep the middle spongy portion smaller as we both like the crisp lacy periphery of the appams. 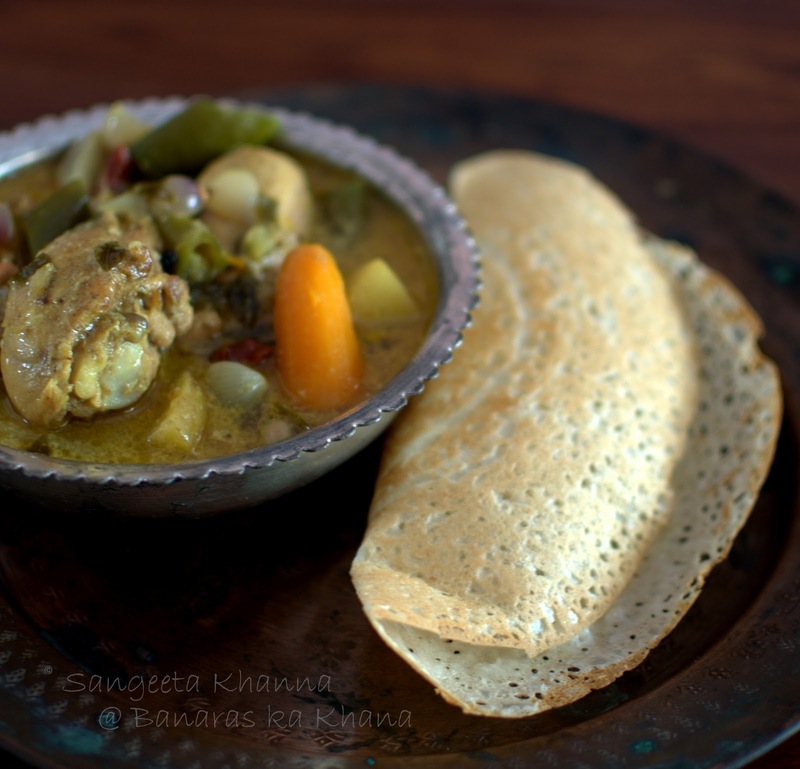 The taste of this combination of curry and a pancake like appam is out of this worldly. 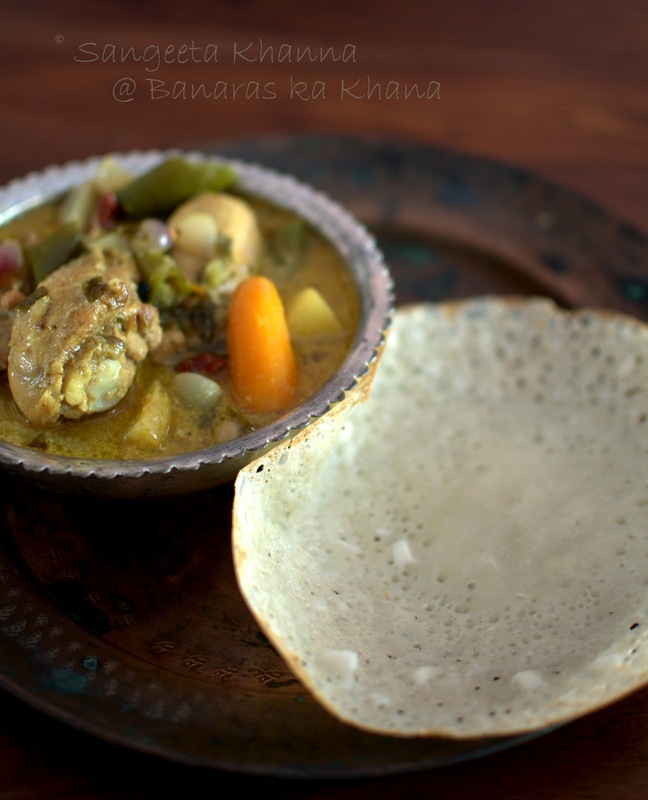 Such meals are special and you don't want anything else to dilute the chicken stew and appam pleasure. Just make the stew and the appam whenever you do this. Nothing else would be touched when this meal is there on the table. Believe me. wow. that is good work. add green chillies instead of red chillies in a stew. and if at all it turns too watery and dont have thick coc. milk, mix a lil corn flour in water and add to it. thanks ladybird.....for the tips as well as for the recipe. Aapam with that kerala style chicken stew makes me nostalgic. U are tempting me a lot with this curry n appam.. Thanks for sending this to my event. this is whole lot of work i guess but worth it. Never tasted a kerala style chicken stew.....pls pass me some!!! Looks nice..me too planing to make appam & stew:)yummy post! !